More than half (60%) of consumers around the world with Internet access prefer to buy products from a familiar brand than to switch to a new brand. Consistency is the key to keeping your brand top of mind and brand familiarity is the key to motivating consumers to choose your brand over your competition. Two very important components of staying competitive in this cluttered advertising world. According to Google, 84% of Americans are shopping for something in any given 48-hour period. The buyers journey is so different now a days than it used to be. Consumers are spending more time in the research phase - so you need to make sure your brand is top of mind, no matter what time of year it is when they decide they are READY to BUY. Research shows that when it comes to data collection there will always be seasonal holiday spikes, but collecting data about your customers all year long may open your eyes to unexpected seasonal trends. Say you assume demand for your product is highest in the Summer, but by collecting data year round you find you have an unexpected spike in demand in the Fall... you would miss this opportunity if you aren't collecting the leads or data consistently all year round. Not to mention that when you collect leads year round, you build a larger contact list, your pipeline is always open, so you have more leads to market to during the year. Marketing efforts are an ongoing experiment. If you want to be successful in your marketing efforts you should be continually analyzing data to find out what makes your audience fill out that form, click that call-to-action button, visit your website, or sign-up for that newsletter. Regularly creating multiple variations of lead-collecting campaigns and testing new methods will help you understand what your audience responds to best. In certain industries, the consumer research process can take months, so you can’t afford to drop out of the advertising space for any portion of the year. Even if during your peak months, you are so busy you think you can't possibly take on any new customers, you must remember there are shoppers out there who are just starting the research process for your product. The key is staying in front of your customers year round. The sales cycle extends beyond the busy season, and the buyer’s journey can take months before customers are ready to make a purchase. To achieve real success, you can’t quit advertising during the high (or low) points of your sales cycle. You need to keep planting seeds. 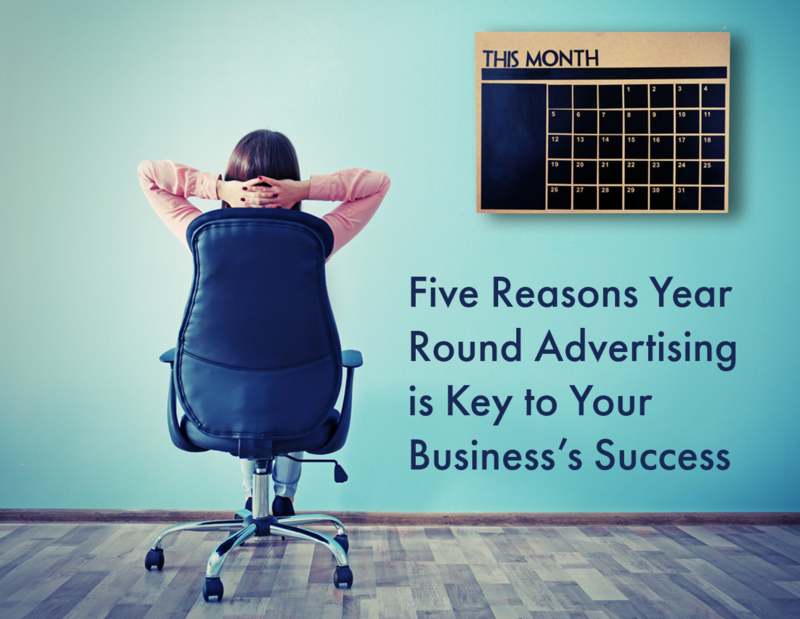 A frequent excuse we hear from businesses about why they don’t run marketing campaigns year round is because they don’t have ideas for campaigns, or because it’s too difficult to run a campaign all year long. If this is your excuse, then Viamedia can help. We are currently running thousands of cross-media client campaigns. We have been developing campaigns for over 17 years and have expertise in every business category: automotive, education, food service/restaurants, travel, retail, hospitals & healthcare, financial services, home services and many more. Our advertising strategists sole purpose is to help you develop a successful campaign idea that will reach your desired goals. If you spend a little time planning your strategy, after the initial setup, it’s smooth sailing. A lot of people are nervous about the hours involved in a long term advertising strategy, but with our team of experts, it’s easier than you’d expect. Ready to take the conversation further?